96 gauge cluster in 97 tbird done!!! Hi all. I don't know if anybody else besides me can't stand the gauge cluster that comes in the 97 bird, well you can change them. It took me almost 4 hours and alot of wire snaps. Only one prob the 97's didn't have the wiring for thre oil pressure so you have to tap it and extend it down to the oil pressure sending unit i guess. Haven't gotten that far yet. Everything works except the oil pressure. I plan on redoing it right one day as far as soldering all the connections and heat shrinking, but for now i am so syked that i actually have a decent set of gauges back in there. Ok sorry about filling th board with non-question type post but i am so syked, and had to tell everybody. -Underdrive Pulleys/ Full Length Kooks Headers/ Dynomax Catback/ 99 Gt Intake Tube/ K&N Panel Filter/ 80mm Lightning Mass Air Meter/ Removed Air Silencer/ 180 T-stat/ Custom Burned Ford chip/ 9mm FRPP Wires. No need to apologize! I know that if I had a '97, I'd want to do the same thing. I'm sure I'm not the only one. Been there,done that.All you need to do its swap the sender out for the '96 model oil sender,and you're done.The wiring is there. johnny, the oil pressure sending unit on the 97 just checks to see if there is oil pressure and the 89-96 sender actually measures how much pressure? so swap them out and i can use the wiring already there? if thats it.......... I got it...... and thanks!! One is actually a NO contact,and the other is a NC contact for the gauge. hey man, you should write a tech article on this. i'm sure a lot of guys would like to try it. i know i do. can you explain how you did it? when i intalled my white face gauges, theres were only two harnesses that plugged into the cluster, i dont recall seeing other harnesses that weren't used. also, did you have to change the piece of the dash that goes around the gauges? i believe they are a different shape. any info would be great. 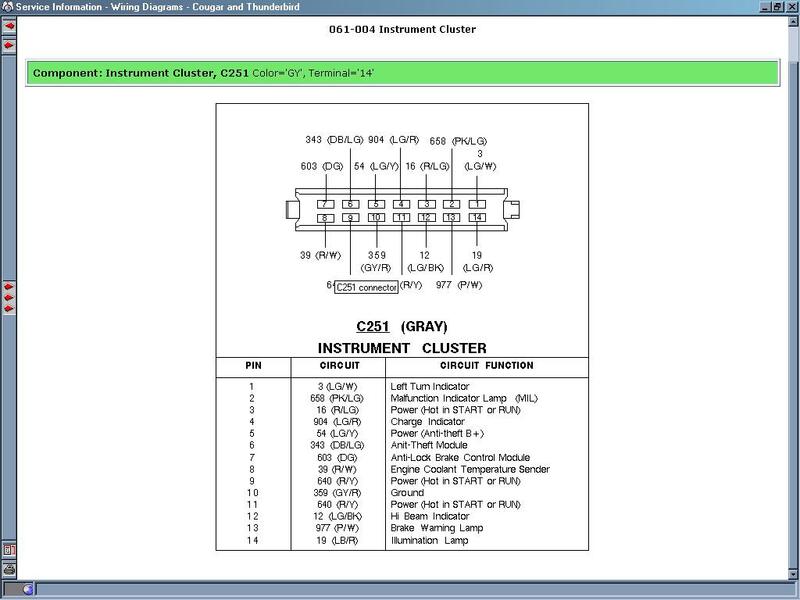 Frank,you need to get the cluster,surrounding trim,and the connector/pigtails off of a donor car(Ford doesn't sell just the cluster pigtails with connectors),a new oil pressure sending unit,and an eletrical schematic of both years.Most of the wires are a simple color-match,the rest are easy from there. I spliced the older style connectors into my existing harness and left the old '97 connectors in place as well-incase I ever needed to swap back. Took me about 3 hours total-and that included splicing and soldering time. sounds fairly easy, i'm pretty good with electrical stuff and rewiring etc. do i just get the oil sending unit from ford? any idea how much it costs. Thanks for all the info johnny. The sender is about $10 or so,and you can get it from Dan,or the local parts store if you feel lucky. sounds good. looks like i have something to do while my car is just sitting anyway. one last question. do all the idiot lights work? The low fuel,door ajar,low washer,and cruise on lights all go away unless you wanna adapt in that goofy info-center that ford used under the radio in '96. None of those are really useful anyway..So I don't miss them. Yeah,all of the other lights work fine.The ABS,CEL,High-Beam,etc..all work just like they're supposed to. Yeah Frank. 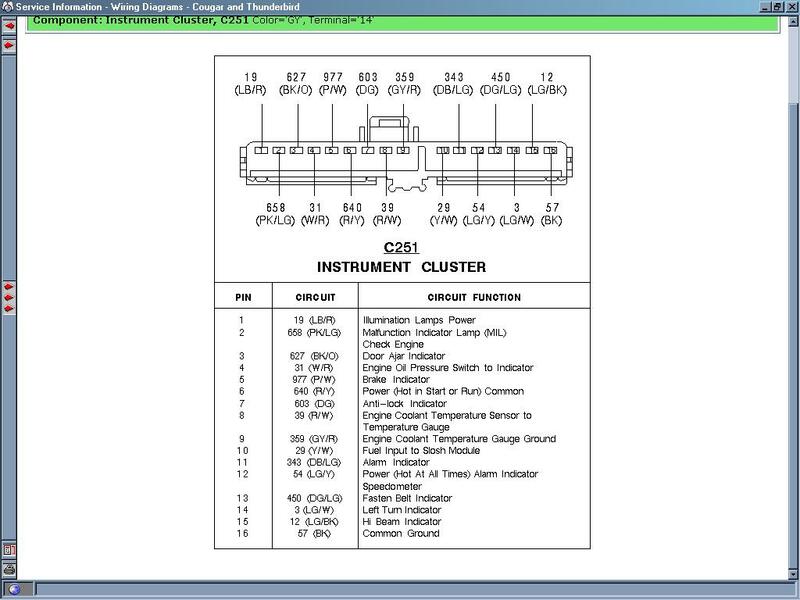 I had alot of people telling me I should write up at tech article on it, and if I can borrow my buddies digital camra I might do it, anyway with a wiring diagram, both 96 gauge cluster harnesses, and 3-4 hours..... It's simple, and anyone can do it. I do owe alot to Gordon ( MANGER THOM ) for the diagrams. Thanks Gordon!!! yea, i'll probably be taking a ride out to a junk yard tomorrow to see what i can find. Oh yeah and remember you need that oil presure sending unit out of a 96 to get the oil gauge working. 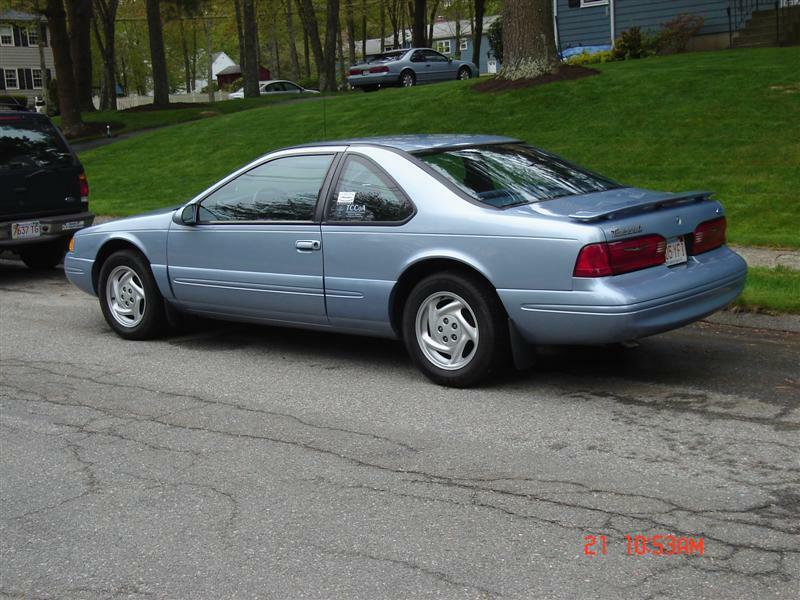 I have not swaped mine yet only because i am pulling the motor out of my junked 96 and putting it in my 97 next weekend so it would be pointless to swap it into the 97 for one week. Once the swap is complete it will work again!!! Well anyway good luck frank!!! It's a worthwhile mod and if you need the diagrams let me know. It's not hard at all-and is why nobody's bothered with a "tech article"
hey guys, i went out to the junk yard today and picked up the gauge cluster out of a 94/95, the 2 wiring pigtails and the dash trim all for $35. i was syked cuz the cluster alone was going for aroun $75-$100 on some internet parts sites. 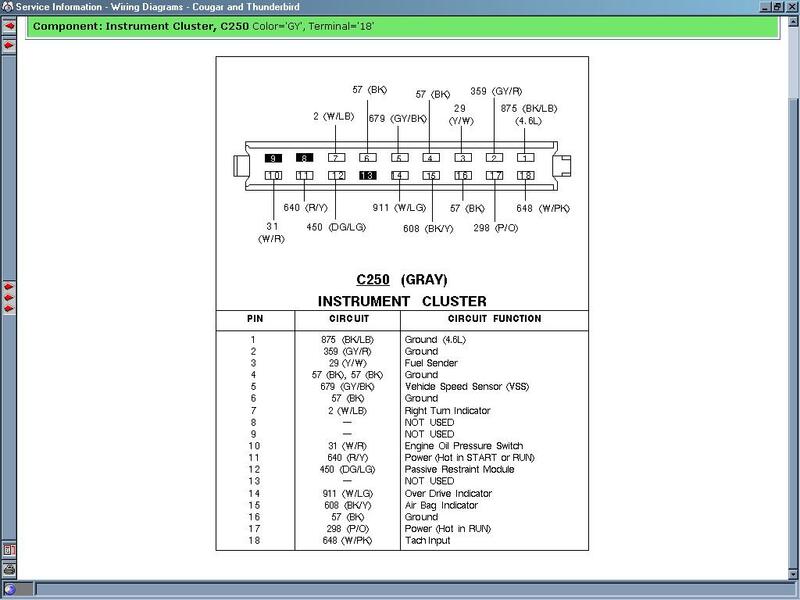 anyway, the wiring diagrams/schematics would be great if either johnny or fast96tbird could post them or email them to me at [email protected] . also does anyone have a part # for the 96 oil sending unit? i just gotta pick up one of those and have scott make me a new set of whuite gauges then i should be all set. thanks for all the help guys. Now that was easy,wasn't it..? thanks, anyone have a part # for the oil sending unit? 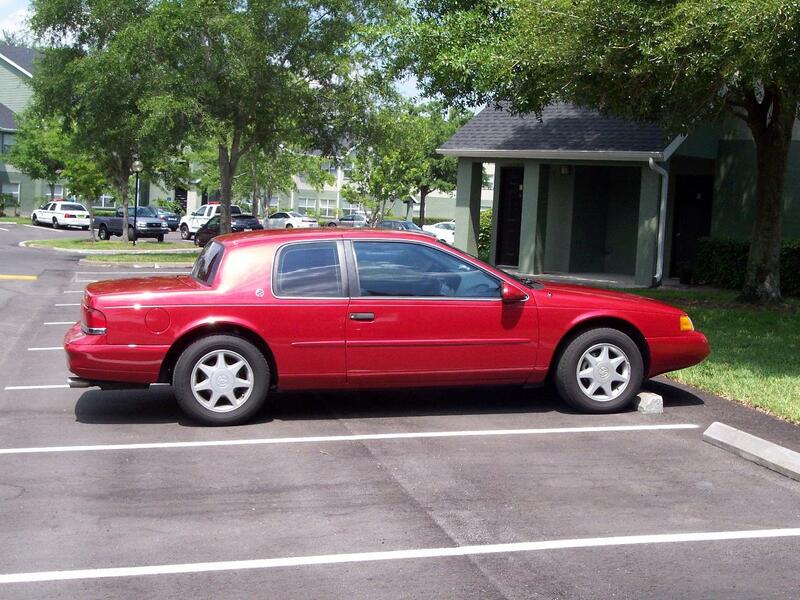 i'm gonna try to go pick it up tomorrow at my local ford dealer. i'm gonna try to get all the wiring done thursday and install the oil sending unit. i just went through the two sets of diagrams and i have it pretty much figured out. the only ones i cant find matches for and pins 4, 6, 16, 17 on the C250 harness from the 96 bird. pin 4, 6, 16 are all grounds and i only see one ground on the 97 harnesses that matches, what should i do with the other two grounds? do i need to use them? pin 17 says power (hot in run) i'm not sure what to do with this any help is appreciated. thanks for all the help so far. 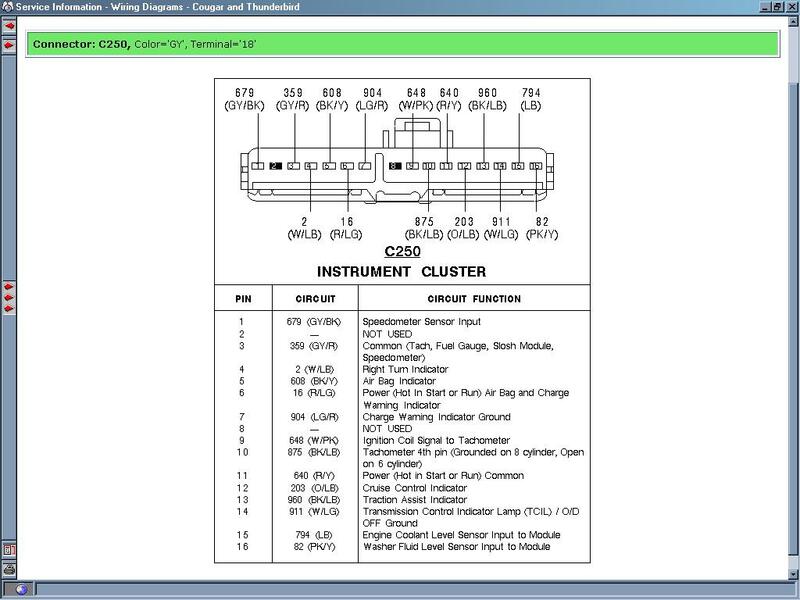 i havent looked at my cars wiring yet, i'm just going by the diagrams, so forgive me if these are stupid questions. anyone know what i should do about those 4 wires. i'm planning on doing the swap tomorrow if i could get this all figured out. Good luck with the swap, from one 97 owner to another! Really I'm not dropping any hints! Sent you a PM. Joe if my swap goes well, i'd be happy to do yours if you want to. You know you miss the low washer fluid light. Admit it. 2007 Ford Mustang GT Premium - SOLD March 2014. 2013 Ford Taurus SHO (TUXESHO) Tuxedo Black Bone stock for now. Thanks for the offer Frank, keep us posted. Frank, I left a couple of wires just taped up behind the dash. ones that didn't connect to anything. there will be a couple of extras. as far as pin 4 goes.....4 and 6 are connected. the ground wire comes in on pin 4 and has a little loop and then jumps to pin 6, so as long as you have 4 connected then 4 and 6 are both hooked up. with 16 on the 96 harness just tap that into pin 16 on the 97 side (so pin 4 and 16 on the 96 harness will both get connected together and then both get connected to pin 16 on the 97 harness). pin 17 on the 96 side i think can be hooked up to pin 6 on the 97 harness. Someone correct me if i am wrong. i don't remeber already how i did it. But that rings a bell. All this will make alot more sense when you get the cluster out and you are looking right at everything. Well if you have anymore questions just post!